Simla, the North Face of Jukko, the Bank in 1850, the Craigs, ... Captn. Mayow's House, &c.&c. 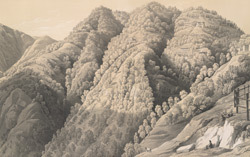 bl.uk > Online Gallery Home	> Online exhibitions	> Asia, Pacific and Africa Collections	> Simla, the North Face of Jukko, the Bank in 1850, the Craigs, ... Captn. Mayow's House, &c.&c. This lithograph was taken from plate 6 of 'Views in the Himalayas' by Mrs WLL Scott. The railings on the right enclose the road at the back of Shimla's Elysium Hill. Rothney House is to the right and directly underneath it is The Craigs, property of Lieutenant Colonel Tucker, the Adjutant-General of the East India Company's troops. For many years before, it had been the residence of Sir Henry Elliott, the Foreign Secretary. Below that is the residence of Captain Mayow, Aide-de-Camp to Sir John Littler, Deputy-Governor of Bengal. Still lower is the Foreign Office. Below The Craigs and to the left is the residence of Prince Soltikoff. On the extreme left is the hill over which winds the road to Mahasu. The British made Shimla the official summer capital of India: successive governors-general (later, viceroys) and other officials entered into a flurry of building summer homes here.